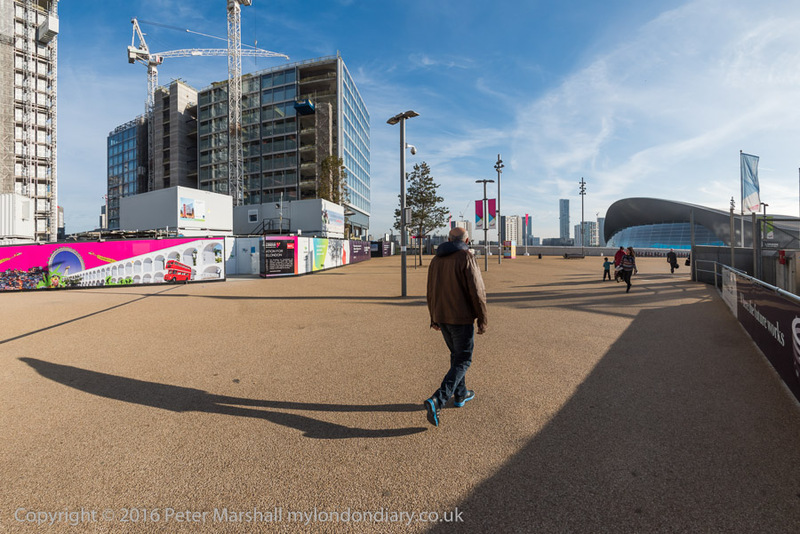 It’s been a struggle getting October 2016 entries up on My London Diary. Though I don’t think there is any real reason for this. If anything the change to a mobile-friendly site has made putting work on slightly simpler, as the page design is a little simpler, though the visual effect is relatively small – unless you are viewing the site on a screen less than 900 pixels across. It was quite a busy and varied month for me as you can see, but I did find time to spend a little time working on urban landscape as well as the usual protests. I was annoyed to realise yesterday that I’d forgotten to go and see the Danny Lyon show which closed a few days ago in London. I’d had it marked down in my list of things to do, but there were just so many other things. Not that I would have seen anything new to me in the show – the pictures in the BJP feature are all familiar. But it’s always good to see real prints on a wall, even though I think much photography works better in books. 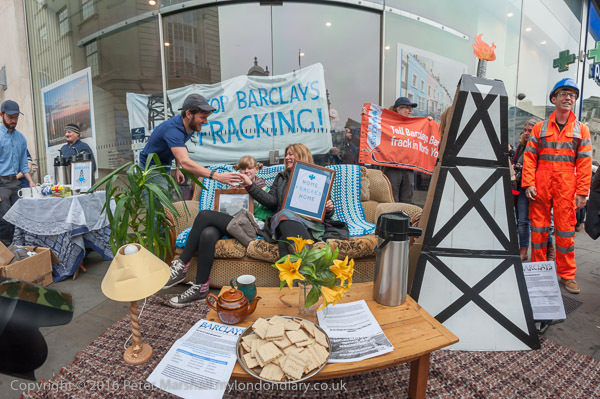 Lyon in yesterday’s The Guardian article Danny Lyon on why he’s naming and shaming ‘climate criminals’ by Alex Rayner mentions the London show, and the comment by Lyon, ‘”There is a show now of my work in a London gallery,” he says. “I have nothing to do with it and no interest in publicizing it“‘, and the article also has a link to a gallery of his pictures from his major retrospective when launched at the Whitney Museum. But the article is about Lyon’s latest book, Burn Zone, and you can download a PDF of this free from his Bleak Beauty blog. You can also order and pay for a print version. The book, Lyon’s newest published work, is described as “a Cri de Coeur directed at the artist community and our youth asking them to join the fight to save planet Earth” and as well as a text about Lyon’s return to New Mexico after 30 years illustrated by his black and white photos, it also includes a state-by-state list of 50 leading US climate criminals prepared by climate activist Josephine Ferorelli at Lyon’s request for “a list of the worst of the worst, a climate j’accuse” with descriptions of their role and contact details, all from publicly available sources. acknowledging the existence of this threat to our lives. So I’ve shared the link here and hope you enjoy and make use of the book and share the work. 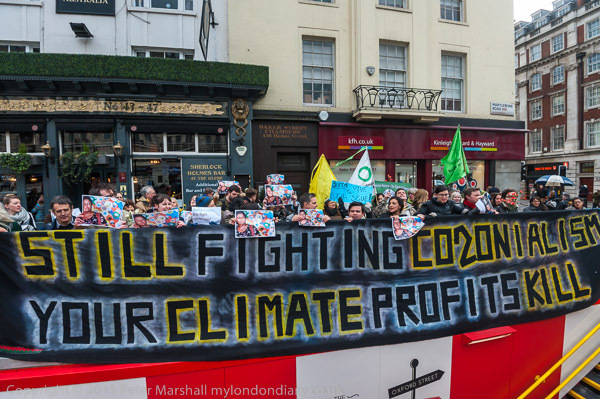 Perhaps we should have a UK supplement naming and shaming our own climate criminals. You can see a post on this blog with more about the Koch Brothers, The Cost of Coal. I’m not very good on names. Actually as I’ve written before, I’m not very good on faces either. But the three people in the picture above I can name. 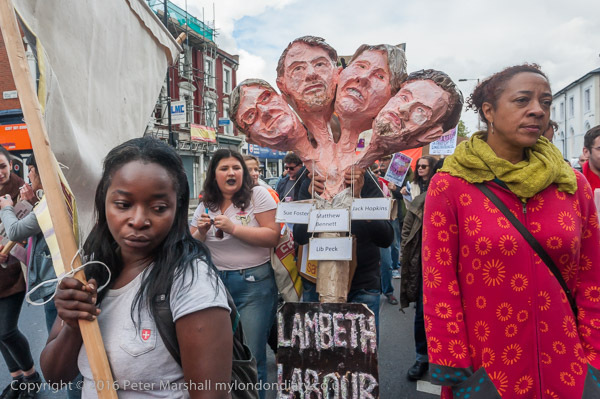 On the left, clearly showing her anger is Didi Rossi of Global Women’s Strike, an organisation I’ve photographed on various protests since the days of film. Didi is clearly angry, and is right to be so, against the government for their ‘class war’ on the disabled and the poor, where their policy of stopping benefits for trivial reasons has resulted in some starving to death. At the right of the picture is the Anti-poverty campaigner Rev Paul Nicolson, founder of Taxpayers Against Poverty whose fight against the cuts has eventually led to him running up huge debts, mainly to pay excessive High Court costs awarded against him (and rather than bankruptcy to an Individual Voluntary Arrangement for repayment.) He was formerly the real ‘Vicar of Dibley’ or rather of Turville in Buckinghamshire where the TV series was filmed until his retirement 16 years ago. And in the centre, standing in front of the London & Eastern Region Unite union banner is Liane Groves, National Organiser for Unite Community who had organised this protest. 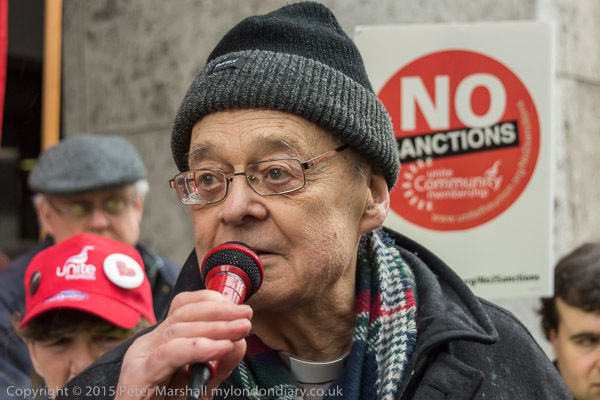 The posters and placards make it pretty clear that it was a protest against sanctions. It would have been nicer to have a little more of the wall plate at the left telling us that this was all happening outside Caxton House, the office of the Department of Work & Pensions, and had that banner been a few inches lower we could have read the name Caxton House above it, but I felt that this was a picture that told its story pretty well. The message was a clear one. 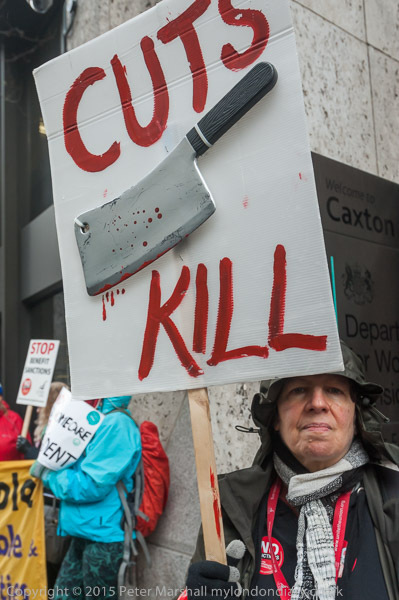 Cuts Kill. 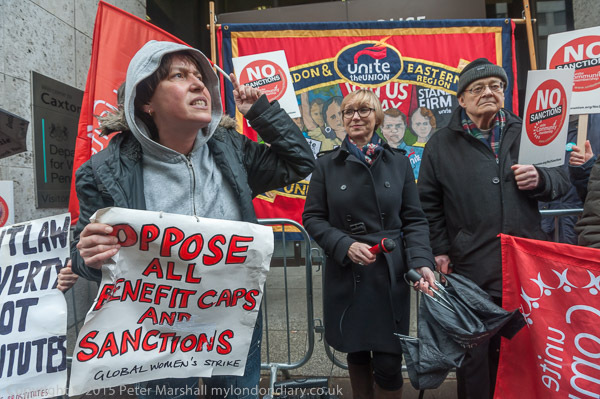 And also with Unite Community was another protest by Gill Thompson, sister of one of the victims of sanctions. 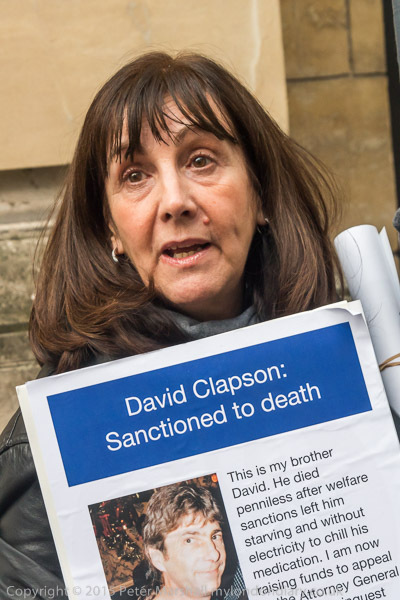 David Clapson was an ex-soldier and a Type 1 diabetic who had left his job to care for his elderly mother and at the time his benefits were stopped was trying hard to find another job. But for missing an appointment at the job-centre (apparently because he had a doctor’s appointment for his diabetes) his benefits were stopped for a month; he had no money to buy food or to recharge his key to keep the electricity necessary to keep his insulin chilled. The result was that he died starving from from diabetic ketoacidosis caused by a lack of insulin. 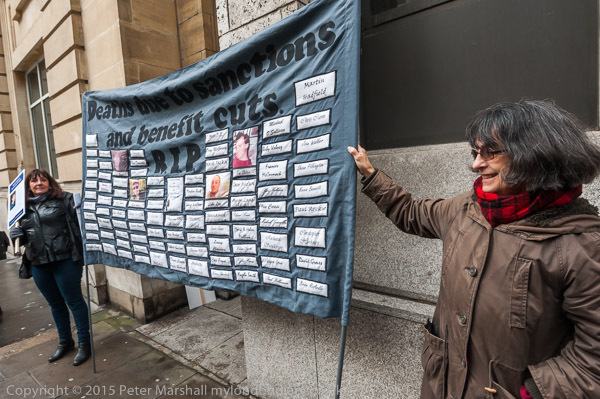 Gill Thompson is fighting to have an inquest which fully examines the cause of her brother’s death, and also against the deaths of others from benefit sanctions, and came with a banner listing the names of many other victims and a petition to hand in to an official from the DWP. 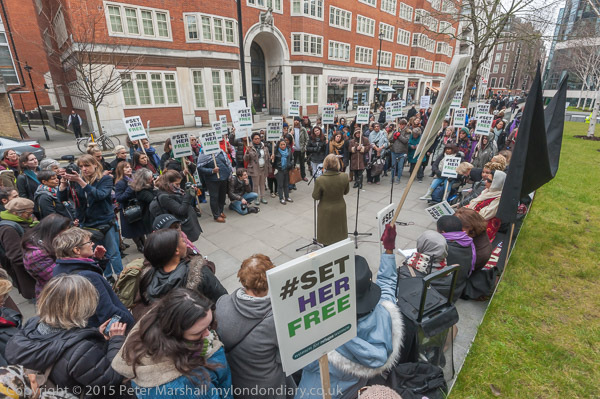 Over 200,000 people have supported her in on-line petitions and this in part led to a Parliamentary Select Committee Inquiry in March 2015, but the government turned down many of its recommendations or ‘accepted them in principle’ – which appears to mean decided to ignore them in practice. March 8th is International Women’s Day, which began in 1909 as a celebration of the previous year’s strike by the International Ladies Garment Worker’s Union, and the day was organised by the Socialist Party of America; the following year it was adopted by the women’s conference of the Socialist Second International and in 1911 it was widely separated across much of Europe, coming to the UK for a suffragette march in 1914. After the revolution it was officially adpoted in the USSR and later celebrated across the communist world, and by the left elsewhere, becoming a more general event worldwide after it was adopted as the UN Day for women’s rights and world peace in 1977. This year I covered two events on International Women’s Day, first a protest by the Independent Workers union IWGB (previously part of the Industrial Workers of the World, or IWW) against the sacking of a woman cleaner at Bloomberg’s Finsbury Square offices, and then at the Home Office by Women for Refugee Women calling for an end to the indefinite detention of asylum seekers, the closure of immigration prisons such as Yarl’s Wood and an end to the detention of pregnant women. 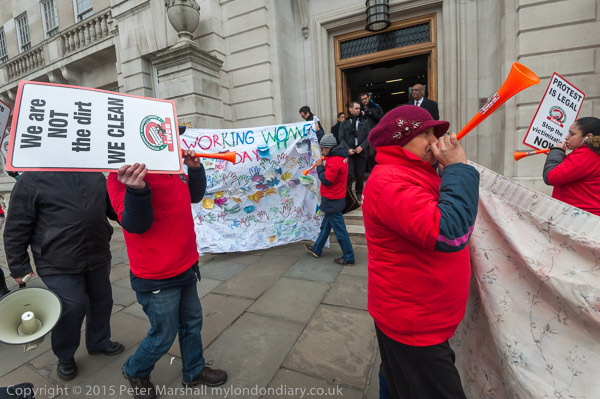 I’ve photographed many actions by the cleaners, both outside and inside various workplaces. 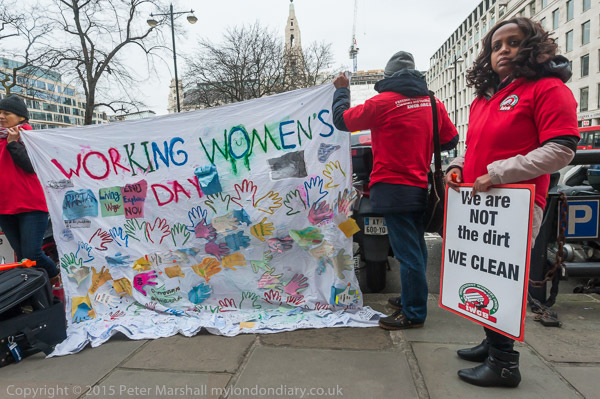 One of their posters states ‘We are NOT the dirt WE CLEAN’, and I remain shocked by how they are treated as second-class citizens and paid a pittance while working at the offices of some of the wealthiest companies in the world in the City of London. Treating employees with decency doesn’t cost a cent – and generally means they will do the job better. 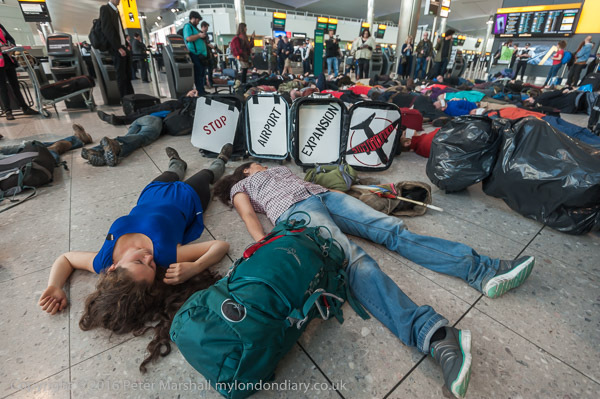 Paying them a wage they can live on in London would only make an infinitesimal impression on the huge profits that most of these companies are making. But they still choose to cheat the cleaners and other service staff by awarding contracts on the basis of saving pennies to contracting companies that treat their workers with contempt and pay them as little as they can. 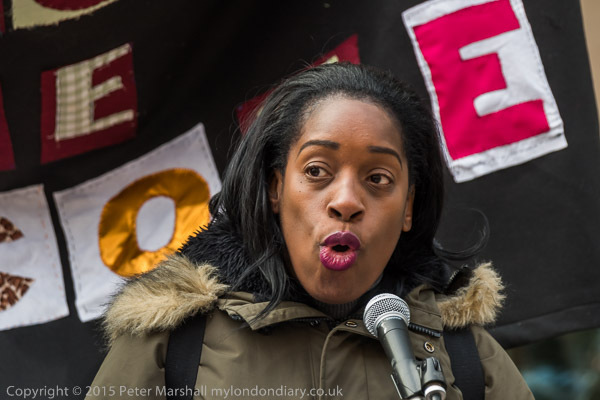 Some companies have agreed – generally after protests by unions such as the IWGB – to pay the London Living Wage, but even then they often find ways to cheat on the agreements – or the contract goes to a new company which tears them up. Many companies are avowedly anti-union and refuse to acknowledge the union that their employees belong to – and our trade union laws bear down heavily on the unions but allow employers to get away with almost everything. Trade union reps and others who demand their rights are often victimised – as with Hanna at Bloomberg. 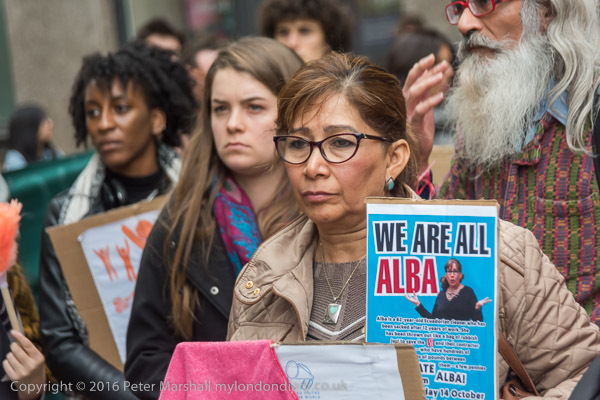 You can see more pictures and read more about her case at IWGB Women’s Day protest over sacked cleaner. 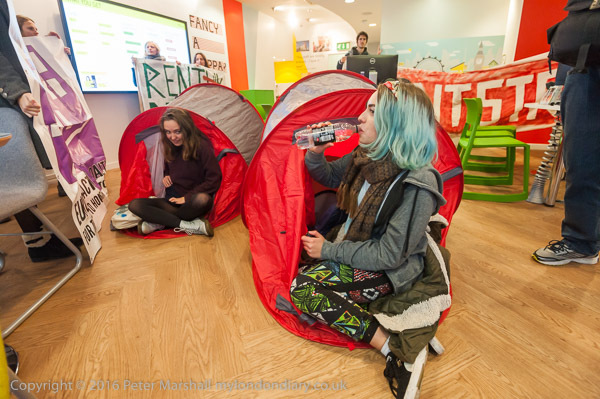 Highly visible and audible protests such as this one are often the only way to get companies to take responsibility for what is happening and re-instate workers and improve conditions. The unions support some employment tribunal cases – and usually win them, but these are slow and now expensive. An unfair dismissal claim and hearing for a single worker costs £1200, an amount intended by the government to stop most people making them, and the claims are often opposed by some of the most expensive legal teams money can buy. 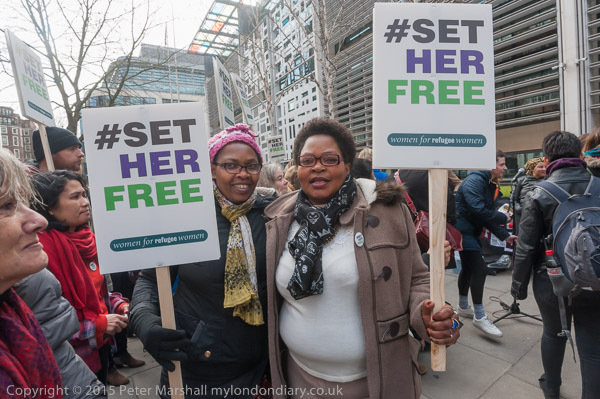 Outside the Home Office I felt a little out of place in an almost entirely female protest by Women for Refugee Women, though there were a number of people who recognised me and clearly made me welcome. Perhaps it was more in my own mind than in any reality, but at times I felt a little as if I was intruding and not entirely welcome. So perhaps my pictures were a little more distant than usual, rather more taken with a telephoto lens than my usual wide-angle. And perhaps I didn’t always feel able to move exactly where I would want to to get the framing as precise as I like. 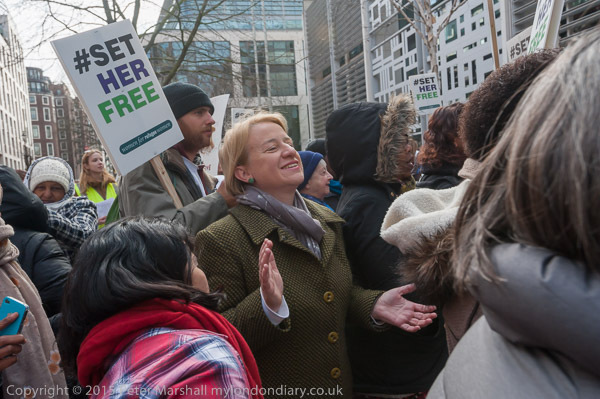 I stayed at the event for around 40 minutes, photographing a number of speakers including two Labour MPs, Stella Creasy and Kate Osamor (above) and then Natalie Bennett. It was sceheduled to go on for another couple of hours, but I was getting cold and felt I’d had enough. Directly opposite where the protest was taking place is a bus stop for a bus which takes me to Vauxhall for my train home, and when I saw an 88 coming down the street I decided to become a “man on the Clapham Omnibus”. That legal hypothetical legal personage dates back to Victorian times, probably first used in court in 1871 – when that bus would have been horse-drawn, but the 88 still follows for part of its journeys) the same route, though now longer to Knightsbridge but to Camden from its southern terminus now called ‘Omnibus Clapham’. But probably it should no longer be the ‘man’ but the ‘person’ riding it. 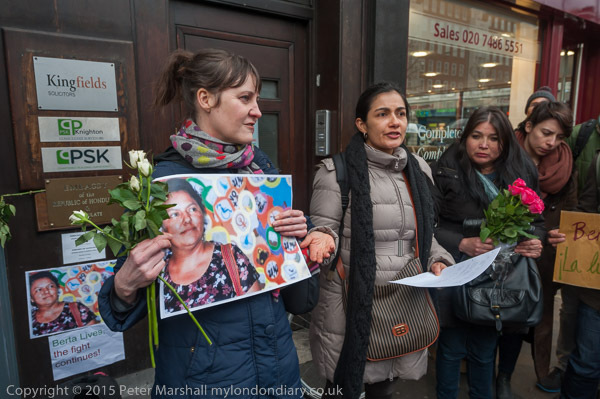 The vigil in remembrance of environmental activist Berta Cáceres, leader of the Civic Council of Popular and Indigenous Organisations of Honduras was a reminder that we are fortunate to live in a country where, at least if you are not a weapons expert with nuclear secrets or a Russian defector, the rule of law usually applies. And while our secretive services may well have been involved in a number of assassinations abroad (including that of Patrice Lumumba, prime minister of the Democratic Republic of the Congo and failed attempts to assassinate Gadafi and Sukarno) as well as some decidly dodgy activities in Northern Ireland that led to the deaths of lawyer Rosemary Nelson and Airey Neave, here things are rather safer. Of course some protesters here have been subjected to lengthy harassment by police, our legal system and some rather more shadowy figures, and a few years ago we had the entirely ridiculous spectacle of Parliament passing a law aimed (unsuccessfully) at getting rid of Brian Haw who was embarassing them by squatting on the pavement opposite. 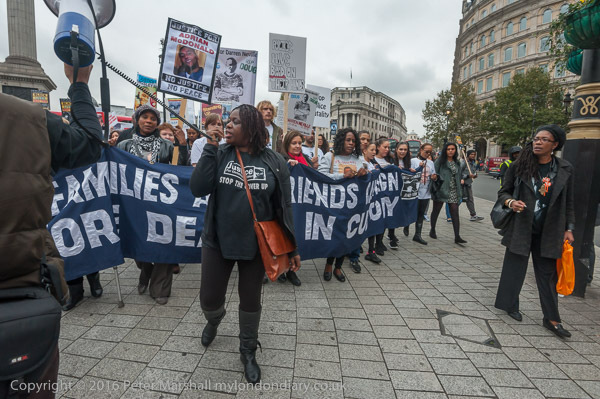 And police fairly routinely provoke protesters by the use of un-called for force and carry out adminstrative punishment by arresting protesters and either releasing them without charge in the early hours of the following morning or – with the collusion of the CPS – making charges which they know have no basis and are only dropped shortly before they come to trial. In Honduras things are rather different and activists who put their heads up are at great risk of their lives. 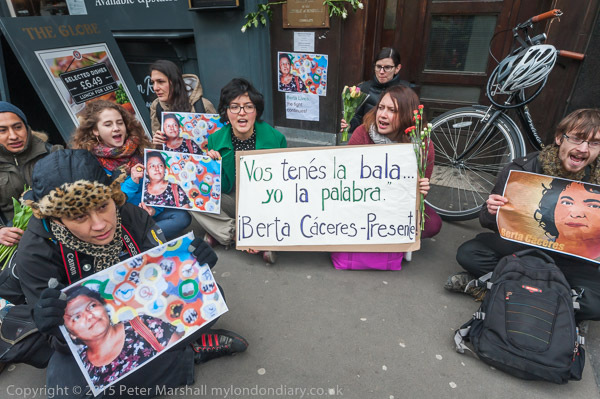 Berta Cáceres is only one of a number who have been assassinated, either by forces of the state or by groups encouraged by the state. Before her murder she had death threats from the Honduran National Police and judicial harassment. It was quite a difficult event to photograph because of the location, crowded into a relatively narrow pavement between the hard to find door of the embassy and the railings around a subway entrance. I arrived early, and eventually managed to find the embassy door, and was able to show it to the protesters who had been looking for it in Baker St around the corner. 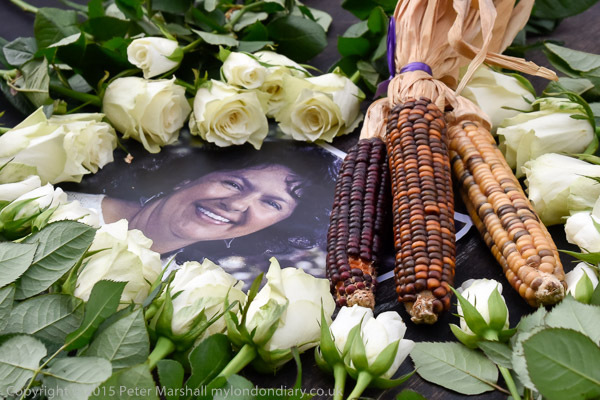 It was difficult for the protesters too, but fortunately the weather was cold and windy which meant that there was nobdoy using the tables and fixed chairs outside the neighbouring pub on which they set up a ring of white flowers and heads of maize around the picture of the murdered activist. 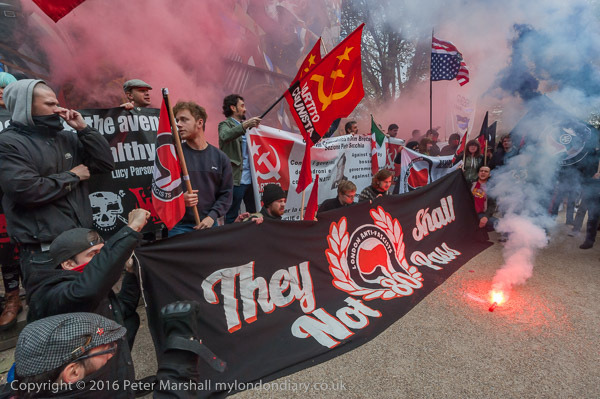 It was hard to avoid rather graphic images advertising the pub food when photographing the protesters with their pictures and posters, and you can see one in the picture above. I’m sure that Reuters wouldn’t approve, but I have darkened and desaturated it slightly to make it less obtrusive. Usually I’d try to include some sign of the embassy in my pictures of any protest at an embassy, and here you can just see it, behind the white roses at the left of the picture. There was another clue to its presence in a Honduran flag on the office on one of the upper floors, but it was too high to sensibly include in any image. A few of the images were made across from the other side of those subway steps, and a few with me clinging to the railings on the small ledge with a large drop behind me down into the stairway. It wasn’t a situation I felt at all happy in, and I soon moved back to safer ground. 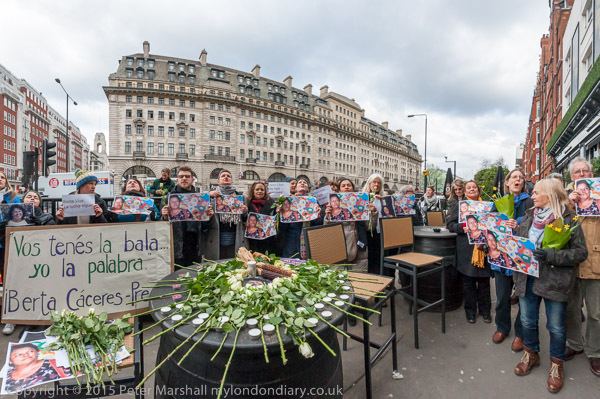 As always in confined spaces the Nikon 16mm fisheye came in useful – with the top picture in this post and two others in Vigil for murdered Berta Cáceres on My London Diary making use of its wide angle of view. As usual I ‘defished’ the images to make the verticals into straight lines and held the camera as close to level as possible to keep them vertical. I’ve seen some rather scary video of UK Bikers and the police harassment of their events which take place on rather out of the way ‘strips’ on the south and eastern edges of London, and although I’ve thought they would make an interesting subject, it’s never been one that I have seriously considered pursuing. And although some of the videos have been interesting, those I’ve watched have been rather amateur, and I’ve seen relatively few good still images. And most of those are by Dan Giannopoulos. Giannopoulos came across some of them when cycling to work on his mountain bike and went over to talk to them, and Lens (again!) has just published a feature on the eigtheen months of work that followed, illustrated by 17 of his black and white photographs. I’m not generally a fan of those photographers who work in black and white simply because they feel it gives their work a more documentary look, but Giannopoulos isn’t one of these, and his use of black and white really suits the subject, though there are just one or two pictures among the 17 where I felt colour might have been better. You can see a few more pictures from this project on his own web site, along with a number of other projects both in b/w and colour. Among the work is another black and white series form 2009-2010 on the UK’s Far Right, which includes some striking images from some events I also photographed. His series was highly commended in the 2015 British Life photo awards, and he was Documentary Series Winner with a series of four images from his project Living with Dementia. As often happens, it was a feature on the New York Times Lens blog that set me thinking this morning , this time by Jonathan Blaustei, the ‘The Rarely Seen Photos by Jack London‘. It wasn’t the first time I had seen photographs by London, with a number of earlier article such as Spitalfields Life’s Jack London, Photographer, published a couple of years ago at the time that Tangerine Press and L-13 Light Industrial Workshop republished his classic study of London’s East End, The People of the Abyss including all all 80 original black & white ‘illustrations from photographs‘ of the first 1903 US publication. Interesting though these are, the poor quality of the original reproduction (which I assume is faithfully reproduced in the republished version) perhaps makes it had to appreciate London’s qualities as a documentary photographer. The book includes images from the East End, where he dressed as a working man and lived with those he photographed and wrote about (an approach which later inspired George Orwell‘s 1933 ‘Down and Out in London and Paris‘ – though Orwell worked only in prose), his work as a war correspondent on the Russo-Japanese war for the Hearst press, the 1906 San Franciso Earthquake, sailing trips to the Hawaiian Islands, the Marquesas, Solomon Islands, and Bora Bora where he documented cultures he saw fated to disappear, and his final photographs of the 1914 Mexican Revolution two years before his death. You can read a review of the book by blogger Ron Slate. This April The Daily Telegraph published a feature accompanying the release of a new book, ‘The Paths Men Take‘ by Contrasto Books which has 70 photographs from his four major photographic coverages, and more recently The Guardian got in on the act. Unlike some other famous figures whose snapshots have been published in later years, London was clearly a serious photographer, taking over 12,000 photographs in his relatively brief career. He saw himself as a professional photographer and was taking his pictures to sell alongside his writing. He called his pictures ‘human documents‘ and while they lack the revolutionary and controversial power of his writing they bring to life the people and events that he photographed. He died on his ranch, aged only 40, having suffered from many serious illnesses on his travels, including scurvy in the Klondike and various tropical infections on his voyages, as well as life-long alcohol addiction on 22nd November 2016. On Lensculture you can see a set of 31 images and a short text by Stephen Shames, The Black Panthers — 50 Year Anniversary. The pictures are a selection from the 200 black and white images by him in the recently published Power to the People: The World of the Black Panthers by Bobby Seale with photographs by Shames. Shames met and photographed Seale at an anti–Vietnam War rally in April 1967 and Seale became a mentor to the University of California student who became the most trusted photographer to the party, remaining by Seale’s side through his campaign for mayor of Oakland in 1973. The story of the Black Panthers is a remarkable one, not least for showing the illegal lengths that a white political establishment was prepared to go to maintain its racist supremacy, with military-style police attacks and a huge campaign of intimidation and assassination by the FBI. Although most of his work has been concerned with the USA – which is perhaps why he is not well known in the UK, his essay Street Kids includes images from Brazil, Bangladesh, India, Romania and Honduras. I’m not sure that ‘“The Dannin Papers,” a series of Guest Posts by Robert Dannin, who served as Editorial Director of Magnum Photos from 1985-90′ actually tell us a great deal about photography, revealing as they are about some photographers, but at least for me the first piece, now on part 4 of 6 about his years with Magnum, based around an interview he gave to Russell Miller in 1995 is a highly entertaining series about the inner workings of the world’s best-known photo agency. It is more than just gossip. More seriously it also shows up Miller’s book as a highly sanitised version of the truth, and I can find little in it that reflects the inside information that Dannin gave him when he was producing his ‘MAGNUM: Fifty Years at the Front Line of History’, as well as giving some insight into the inner workings of what would appear also to have been one of the world’s most dysfunctional organisations. Dannin gets 5 lines in the book, with a note of his resignation and a very pithy quotation of his reasons; Haiti, the first of three disasters which Dannin recounted to Miller in the current post, does not even feature in the book’s index. Perhaps things have changed a little since then, and though there are still some fine photographers in Magnum, it no longer really deserves or enjoys the reputation it had back in the last century, with other agencies now encouraging much of the best photojournalism and Magnum sometimes appearing a little past its best-before date. When I started in photography it was every young photographer’s dream to become a Magnum member, but I think few harbour that aspiration now. Those of you who missed Thursday evening’ celebration of the life of Colin O’Brien can get some idea of the event from a short film made at the event by Sebastian Sharples and featured on the Spitalfields Life site. Colin was a good photographer with an exceptionally long career who began taking photographs about the time most of us learn to read, and a acquired a Leica which an uncle found in the back of his taxi as a teenager. His early pictures are an intimate record of working class life in London in the immediate postwar period, for me a reminder of growing up in a similar age in a rather less interesting area of outer London. I think most if not all who met him remember him as an extremely generous man, and the event reflected this. It was interesting to listen to two of his boyhood friends talk about him and their lifelong friendship, and to see some of his better images projected both on a small screen in the church and a larger area of wall in the crypt afterwards, where we ate excellent pork pies and eccles cakes with some rather fine cheese and oranges and toasted his memory with wine, beer or blackcurrant cordial. The blackcurrants had come from his last assignment with Spitalfields Life, when together with ‘The Gentle Author’ and a coachful of EastEnders they went to glean in the previously machine-harvested blackcurrant fields of Tudeley, and the cordial was served in bottles decorated with some of the images he took. We got the story of this told during the celebration, and how a rather unsatisfying trip to the pub by the two of them had resulted in them being diverted by the church and finding its unique windows by Marc Chagall. I was a little surprised when I first read this to find the windows came as a surprise and wondered if this was merely a little fictional embellishment. I’d heard about them but never visited, though my wife had seen them when she was taken to hear a concert in the church. But putting ‘Tudely’ into Google (surely the kind of research everyone now does before visiting a new place?) immediately brings them up. It wasn’t one of Colin’s best assignments – and he was a man whose best photography came from his own wanderings rather than on assignment, though there are some good pictures of people in the many time he photographed for Spitalfields Life. We were reminded of this in a film shown in the ceremony and in what seemed a very fitting and generous gesture as we left the church, where everyone was handed a paper bag containing a couple of envelopes of pictures of his work and the fine book which resulted from wandering around London Fields where he came across a group of traveller children, returning on several occasions to photograph them. It’s a book I already have a signed copy of, but one of my friends who was unable to attend will benefit from. You are currently browsing the Re-photo blog archives for November, 2016.